Welcome to Pugbitz Denton, the best independent specialists in the Northwest for Peugeot, servicing, spares and repairs. Pugbitz is a family run business with over 100 years accumulative Peugeot experience by fully qualified Technicians in the Peugeot vehicle parts, repairs and dismantling industry. Our commitment to provide a friendly and personal service has enabled us to supply a wide range of new and used Peugeot parts to trade and the general public. 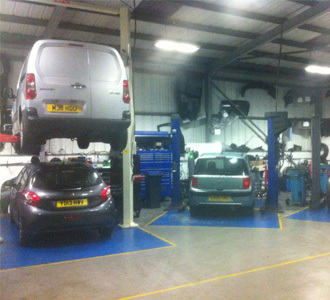 Our service centre facility is based on site and is fully equipped providing servicing and MOT for all makes and models of vehicle. Check out our great and unique MOT offer. You can be assured of a high level of service and customer care from our service team members and our parts personnel; providing a fast, efficient and friendly service. Don‘t just take our word for it, here is what our customers say. Our MOTs and Servicing are carried out by Peugeot-time served technicians, each a Jedi master in all things Pug! Ask about our unique offer of FREE MOT on any car, ANY owner, within 12 months of a Pugbitz service. Pugbitz of Denton pride ourselves on supplying top class value for money & the very best after sales service. Please don't hesitate to contact us if you can't find what you are looking for. Our friendly staff are on hand to help.